In Eastern Africa contrasting ecological zones within relatively short distances encourage economic specialisations which are reliant upon one another. Connections between different economic groups are facilitated by a variety of institutionalised networks that encourage the movement of both goods and people across boundaries. The role of livestock as essential capital ensures a strong impetus to increase agricultural production for exchange while, at the same time, the need to acquire livestock through ties to the pastoral community ensures that certain agriculturalists are confined to relatively limited areas at the margins of pastoral zones. In contrast to traditional models of agricultural development, the shift to intensive techniques may not be a radical departure from earlier practices, but rather much less labour intensive and gradually developed, aimed at expanding and improving natural zones of high productivity. This situation may have been exasperated by climatic fluctuations while lineage systems of social organisation encourage the localised marginalisation of politically unified descent groups and the development and expansion of large-scale agricultural works. Eastern Africa has long been renowned for its highly specialised pastoralists (Gulliver, 1955; Herskovits, 1926; Hollis, 1905; Spencer, 1965). However, it is only in more recent years that recognition has grown of the extent and accomplishments of the region’s ‘specialist’ agriculturalists, as evidenced by the growing body of literature on Eastern African ‘islands of intensive agriculture’ (Sutton, 1989c; Widgren, 2000; Widgren and Sutton, 2004; Stump, 2006a; Stump, 2010; Davies, 2008; Davies, 2012). These ‘islands’ are highly productive in contrast to surrounding ‘seas’ of lower productivity and less intensive land use such as shifting cultivation and pastoralism. They are distinctive in displaying considerable investments in land and technology, including integrated systems of irrigation, hillside terracing, and other soil management strategies. These systems are further surprising in that they fall not in areas of higher rainfall, but rather within or on the margins of semi-arid areas, with paradoxically high population densities. The development of these ‘islands of intensive agriculture’ has long posed a challenge to archaeologists, geographers and historians alike. One solution has been to treat them as independent, discrete, and historically situated events (Amborn, 1989; Anderson, 1989; Anderson, 1988; Börjeson, 2004a; Börjeson, 2004b; Loiske, 2004; Östberg, 2004; Sheridan, 2002). The other, of course, has been to look for patterns of behaviour that cross-cut ethnic and linguistic divisions and which represent similar responses to similar environmental and economic stimuli (Boserup, 1965; Håkansson, 1989; Gourou, 1991, as cited in Widgren, 2004; Widgren, 2004). Neither approach is mutually exclusive; however, I argue here that similar patterns of behaviour can be identified within a number of regions and that these patterns result from broadly similar underlying ecological processes. 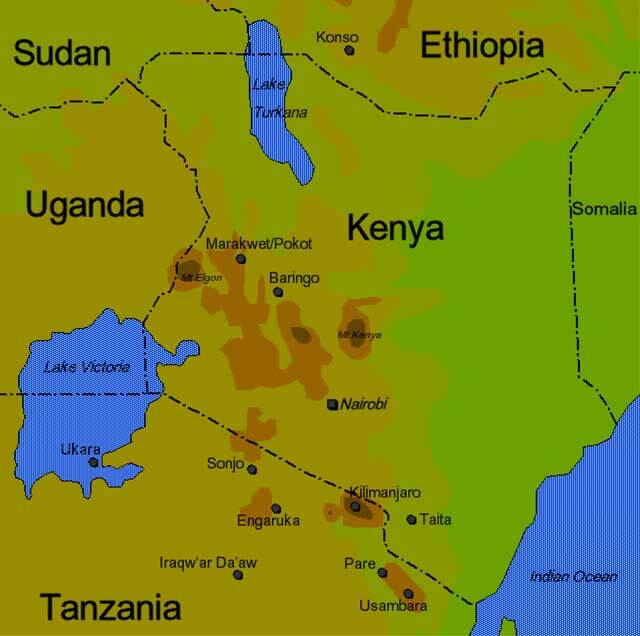 The Eastern African environment, particularly the Rift Valley region, presents dramatic variations in geology, soils, topography, rainfall, and vegetation that lend themselves well to economic specialisation (Kusimba and Kusimba, 2004: 397). Traditionally this specialisation has been enshrined in the distinction between pastoralists and agriculturalists, however, in recent decades a growing body of literature has pointed out the fallacy of this dichotomy. ‘Pure’ agriculturalists and ‘pure’ pastoralists represent extremes (at times short-lived) along a continuum of various fluid and shifting economic practices (Anderson and Johnson, 1988: 10; Spear and Waller, 1993; Spencer, 1998; Waller, 1988: 111). Furthermore, it is now commonly recognised that, rather than being self-contained economic systems, agricultural and pastoral economic activities are intricately entwined. Dense exchange and kin relations criss-cross economic and ethnic boundaries throughout the region (Håkansson, 1994; Håkansson, 2004; Håkansson, 2008; Håkansson and Widgren, 2007; Loiske 2004: 109; Östberg, 2004: 28; Sheridan, 2002: 90; Spear, 1993: 120; Waller, 1988: 94; Pollard et al. in press). Moreover, from time to time, particularly during certain crisis events (e.g. drought, conflict, disease), individuals, and even large groups, can draw upon these deeply rooted cross-economic/ethnic ties to facilitate a change to their whole way of life (Anderson, 1988; Anderson, 1989; Spear, 1993; Spear, 1997; Waller, 1988). While specific historical details condition the nature and exact timing of such events, they nevertheless represent deeply sedimented, tried and tested, responses to more or less predictable fluctuations in climate, politics, conflict etc. (Anderson and Johnson, 1988: 6; Waller, 1988: 74). The patterns of response and support exposed during periods of crisis highlight the important function of the everyday, institutionalised, exchange and kin networks that cross economic boundaries in Eastern Africa (Waller, 1988: 74). I argue that these networks allow for, and support, the creation of the economically specialised and inter-dependent communities, both pastoral and agricultural. In this sense the metaphor of islands of intensive agriculture is misleading in that it ignores the vast regional exchange networks which support any ‘island’. As Widgren (2004: 17) has suggested, the metaphor of icebergs might be more appropriate. I begin by establishing some definitions and outlining the distribution and technical characteristics of intensive agricultural systems in Eastern Africa. I then explore past models of intensification, both worldwide and specifically Eastern African, and emphasise their limitations. Drawing on various sources, including my own research among the agricultural Pokot and Marakwet of northwest Kenya, I go on to develop a new model of agricultural intensification, which I term the ‘exchange networks model’. I show how the development of regional exchange networks based on economic specialisation, when accompanied by notable variation in the spatial distribution of recourses, constitutes a set of conditions under which agriculture may be intensified (Börjeson, 2004a; Håkansson, 1994; Håkansson, 1995; Håkansson, 1998; Loiske, 2004; Östberg, 2004; Sheridan, 2002; Widgren, 2004). Much of the debate surrounding the definition of intensive agricultural systems has focused on defining the process of intensification. Given that intensification is a relative term, there is no hard and fast definition of an intensive agricultural system (or, for that matter, of an extensive one). Intensification may be simply defined as the application of any humanly derived input that increases agricultural yields per unit area and time (Håkansson, 1989: 14). These inputs may include increased frequency of cultivation, increased labour (relating to tillage, weeding, fencing, protection etc. ), technological innovations such as new tools, crop varieties, cropping schemes, manuring, and investment in ‘landesque capital’ such as elaborate soil (e.g. terracing, ridging) and water conservation techniques (e.g. terracing, irrigation) (Brookfield, 1984; Brookfield, 1986; Håkansson and Widgren, 2014). By definition, intensification does not include new inputs of land—this is simply expansion, whether the new land is cultivated using intensive techniques or not (Turner and Doolittle, 1978: 297). Intensification, then, can only be measured for a given area of land and only represents an alternative to expansion as a means of increasing production. Given the difficulties of directly measuring productivity or output, Boserup (1965) chose to measure intensification approximately by cropping frequency. However, this has proven to be a controversial surrogate, with many researchers arguing that the type and variety of ‘agrotechnologies’ employed, while difficult to quantify in themselves, are intricately related to increased production per unit area and time (Brookfield, 1972: 31; Turner et al., 1993; Turner and Doolittle, 1978: 299). Indeed, as Brookfield (1972: 31) has noted, it is the application of various agrotechnologies which often allows for increased cropping frequency. Moreover, we might also argue that agrotechnologies can increase productivity without any concordant increase in cropping frequency (Turner and Doolittle, 1978: 299). It is now generally accepted that some compound surrogate, taking into account cropping frequency and agrotechnological input, is needed to provide an accurate measure of agricultural intensity (Turner and Doolittle, 1978). Of importance to the following discussion is the recognition that this view deconstructs perceived barriers to certain forms of intensification and shows how intensification can occur without obvious pressures or indeed without specific increases in labour expenditure. Indeed, intensification can even occur through undirected cultivation practices of a more ‘indeterminate and incremental nature’ (Börjeson, 2004a: 25–26, 83; Davies, 2014; Doolittle, 1984). Recent studies in Eastern Africa have focused on the prominently visible aspects of landesque capital, perhaps to the neglect of more subtle aspects of intensification such as decreased fallowing periods, crop rotation systems, anthropogenic soils and labour intensive tending practices (weeding, fencing, tillage, ridging etc. ); a bias that might be termed the ‘tyranny of monuments’ (Börjeson, 2004a, 80–81). These visible landscape features have served to mark certain areas out as being ‘different’ to surrounding production systems that utilise alternative (though not always less productive) techniques. It is particularly important to remember, however, that, while it is likely that areas employing landesque techniques produce high yields, we should not assume that productivity in these areas is necessarily higher than areas where less visible (or even no) intensive techniques are employed. Yields remain conditioned by natural variations in soil and climate and it may therefore not be a coincidence that many of the systems employing landesque techniques are found in relatively marginal areas with low rainfall and only limited zones of naturally high productivity. A brief review of various relatively ‘intensive’ farming systems across Eastern Africa serves to illustrate some of these ideas (Figure 1). Islands of intensive agriculture in Eastern Africa (as mentioned in the text; modified from Widgren 2004). Large parts of the Ethiopian highlands are terraced using both stonewalling and earthen contouring (Grove and Sutton, 1989: 121). By far the best known system is that of the Konso (Amborn, 1989; Hallpike, 1972; Watson, 1997; Watson, 2002; Watson, 2004), who employ a variety of soil- and water-conservation techniques, most notably drystone bench terraces, commonly 0.5–1.5 m in height. Rainwater harvesting techniques are also widely employed, with small ridges, furrows and terrace walls constructed to channel rainwater onto fields. Small canals of mud and stone are built off temporary or minor streams and occasionally stone dams are built across these streams to increase water levels and facilitate take-off. Cattle are also stall-fed in the homestead and their manure is collected and used as fertiliser (Amborn, 1989: 73–78; Watson, 2004: 52–55). Moving southwards irrigation agriculture combined with various forms and densities of hillside terracing is practised throughout the Cherangani Hills and Kerio Valley of northwest Kenya. The irrigation canals (commonly known as ‘furrows’) of the Pokot and Marakwet have clearly been in use for well over a century as accounts by early European travellers attest (see Austin, 1903; von Höhnel, 1892; Thomson, 1885), while archaeological, oral historical and generational data suggest ages of 300–200 years, but with considerable reorganisation, expansion and abandonment over time (Davies, 2008; Davies, 2012; Davies et al., 2014). In the Tamkal or Wei wei Valley in the northern Cherangani Hills, Davies has recorded some fifty-nine contemporary and thirteen abandoned irrigation canals ranging from a few hundred metres to several kilometres in length. These are excavated from the slope, are at times stone-lined, and are often reinforced on the down-slope side with considerable embankments (Figure 2A). 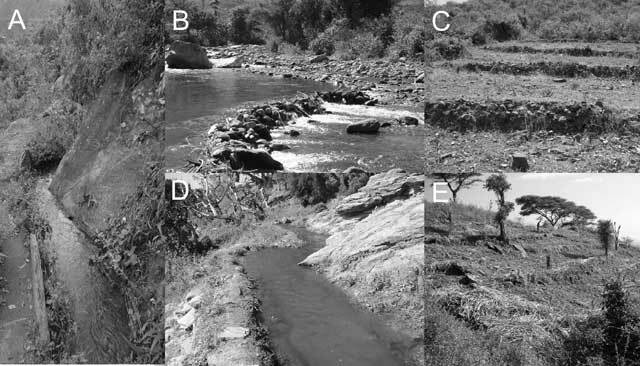 Substantial dams and intakes of stone, brush and wood are often constructed to capture the irrigation water (Figure 2B) (Davies, 2008; Davies, 2009). Manuring using dung from livestock kraals is also occasionally employed, while small field clearance cairns and a variety of forms of hillside terracing are common (Davies, 2009; Davies, 2014). A. Stone lined irrigation canal, Pokot. B. Dam and intake canal, Pokot. C. Stone terracing, Pokot. D. Irrigation canal, Marakwet. E. Simple ‘trash’ terracing, Marakwet. To the south, the irrigation agriculture of the Marakwet has received much greater interest (Adams, 1996; Adams et al., 1997; Davies et al., 2014; Hennings, 1951; Östberg, 2004; Soper, 1983; Ssennyonga, 1983). New extensive surveys of the Marakwet system have GPS recorded some 91 irrigation canals (locally called furrows) totalling some 315 km of main branch canals which would indicate some 4–5,000 km of irrigation canals in total. The longest of these canals is 15.8 km in length with an altitudinal range of over 1400 m. In addition to these visible landscape features, recent work has also recorded extensive knowledge of soils and crops and has mapped out complex integrated patterns of semi-permanent and shifting field systems, the former cultivated at the household level and the latter communally by the lineage (Davies et al., 2014). Analysis in both Pokot and Marakwet has demonstrated the temporal dynamism of both systems, showing how they move and shift across the landscape at a variety of temporal scales (Davies, 2014; Davies et al., 2014). Southwards within the Kenyan Rift Valley, the nineteenth century practice of irrigation agriculture by the Il Chamus Maasai, at the southern end of Lake Baringo, has been documented by Anderson (1988; 1989; 2002) and Spencer (1998: 129–198). Elsewhere within Kenya, irrigation practices have been described in the Taita Hills (Fleuret, 1985) and, more recently, among the Machakos near Nairobi (Tiffen et al., 1994). In the interlacustrine region intensive agricultural practices are less well documented, the best known being on Ukara Island, Lake Victoria, where extensive stone-walling is used to divide and level agricultural plots (Ludwig, 1968). Moving southwards into Tanzania, intensive agricultural practices, often based on canal irrigation, involving crop rotation systems focused on banana cultivation, are documented on the slopes of Kilimanjaro (Grove, 1993; Masao, 1974; Pike, 1965; Stump and Tagseth, 2009) and Meru (Spear, 1993; Spear, 1997), and in the mountains of North Pare (Heckman, 2014; Sheridan, 2002), South Pare (Håkansson, 1995; Håkansson, 1998) and Usambara (Feierman, 1990; Figure 3A). Baumann’s observations of old abandoned irrigation canals in South Pare indicate that irrigation was practised in this area well before his visit in 1890 (Håkansson, 1995: 303), while Johnston’s (1886) account of irrigation among the Chagga of Kilimanjaro attests to an extensive and well developed system by at least the 1880s. Based on oral histories, various authors argue for a considerable antiquity to irrigation agriculture in northeast Tanzania (Masao, 1974; Widgren, 2004). Technologically, Grove (1993: 431) has shown that the irrigation system in Uchagga, similar in design to that of the Pokot and Marakwet, now involves around 1800 km of main canals and a throughput of 200 million cubic metres of water annually. A. Irrigated fields, Usambara. B. Abandoned field system, Engaruka. C. Abandoned irrigation canal, Engaruka. D. Minor irrigation canal, Pokot. Complex irrigation systems may have developed from ‘proto-intensive’ techniques similar to this. Moving to the west, the Sonjo of northwest Tanzania possess a well-studied agricultural system involving canal irrigation (Adams et al., 1994; Gray, 1963). Irrigation construction techniques here are once again similar to those of the Pokot and Marakwet, except that they lack stone lining. A number of studies have suggested links between the agricultural system of the Sonjo and that of the abandoned agricultural ruins at Engaruka and its surroundings, situated at the foot of the Rift Valley wall between Lakes Natron and Manyara (Nurse and Rottland, 1993; Sutton 2004: 127). Engaruka has received a considerable amount of attention over the years (Robertshaw, 1986; Sassoon, 1966; Stump, 2003; Stump, 2006a, Stump, 2006b; Sutton 1986; Sutton 1998; Sutton, 2004) with radiocarbon dates falling in to a coherent range from the fithteenth to eighteenth centuries AD (Robertshaw, 1986: 18; Stump, 2006a: 189). The Engaruka field system, represented by stone-revetted terracing on the lower parts of the escarpment, stone field divisions on the valley floor (Figure 3B), and a series of stone-lined irrigation canals (Figure 3C), covers an area of over 2000 ha. Given the sizes of associated villages, this area would perhaps have originally supported a population of as many as 3–5,000 people (Davies, 2010). The irrigation system consists of a series of artery canals leading from the perennial Engaruka River and three currently seasonal streams. Recent work has demonstrated how these form a complex system of both irrigation and sediment capture with fields being ‘built up’ from rich sediment washed down from the highlands (Stump, 2006b). Stone enclosures situated within the field system attest to some form of integrated kraaling and manuring, a hypothesis which has found some support in soil chemical tests (Stump, 2003). The development and decline of the Engaruka system has also been partly correlated with climatic changes by some authors, but further high resolution palaeoclimatic research with direct links to known historic agricultural regions as begun by Westerberg et al. (2010) is required. Moving southwards from the crater highlands, much research has focused on the agricultural practices of the Iraqw (Börjeson, 2004a; Börjseon, 2004b; Loiske, 2004). Here, agricultural practices include the gradual formation of gentle terracing through downhill hoeing. Storm drains are often cut into these terraces to lead off excess water, while many valleys are drained via ditches to facilitate cultivation. Manuring is also common practice, as are various forms of composting using household organic refuse, and green manuring involving the burial of crop residues as mulch (Börjeson, 2004b: 77–78). While these systems display a degree of variation in terms of specific technological attributes and likely represent independently generated solutions to specific socio-political and environmental circumstances, they nevertheless share certain similarities (Adams et al., 1994: 19). The levels of technological intensification are broadly similar, as are their positions on, or close, to ecotones, and their distinct contrast to surrounding regions of much less intensive production. In attempting to explain the development of these agricultural systems we need to consider these similarities in greater detail and review their importance in relation to the broader patterns of production and consumption which characterise the region. Boserup (1965) argues that intensification is ultimately driven by population density and thus that, given a finite area of land and a growing population, people invest in new ways of increasing agricultural productivity per unit area (i.e. via increased frequency of cropping, new tools, new crops, manuring, landesque capital etc). The Boserupian relationship between population pressure and agricultural intensification initially found support (Clark and Haswell, 1970; Geertz, 1963; Gleave and White, 1969), but has come under increasing pressure. Brookfield (1972) emphasised the notion of ‘optimum return per unit input’ and has suggested that the cost of developing an improved optimal system may act as a barrier to intensification. Moreover, along with others (Grigg, 1976; Grigg, 1979), he has argued that disintensification may serve as a viable and highly optimal alternative given the costs of increased intensification in certain circumstances. At the same time Brookfield has questioned the law of diminishing returns that Boserup postulated. Labour efficiency is not necessarily reduced along with the shift to more intensive techniques. Innovation in terms of adopting new crops, tools or techniques may result in increased production without increased labour input (Börjeson, 2004a: 32, Börjeson 2007; Brookfield, 1984: 16; Farrington, 1980: 288). Allied to these critiques has been the recognition of possible multiple alternative incentives towards intensification, such as the existence of markets, demands for tribute or tax, desire for ‘social’ surplus, and the accumulation of surplus as a buffer against hard times. Also important is the recognition that agricultural labour should not necessarily be quantified in terms of average person-hours per unit land per unit time; rather, we must understand the seasonal peaks and troughs of labour expenditure. If labour input increases under an intensive system during seasonal periods of inactivity then the disincentive to intensify may be diminished.1 In particular, it is clear that the Boserupian population pressure theory is based on a highly questionable evolutionary progression from extensive to intensive agricultural forms. In this view intensification is always the result of pressure on resources due to circumscription of alternative extensive solutions and is thus, wrongly, never seen to be an optimal choice in the absence of population pressure (see discussion based on Sherratt (1980) below). A related flaw is that the Boserupian model does not adequately deal with the notion of how ‘population pressures’ occur. Except under very specific conditions, expansion and mobility provide an acceptable alternative to intensification. Thus, any good theory needs to explain the specific constraints on mobility that result in significant population pressures.2 Indeed, this critique is as true for the Boserupian model as it is for any other. While specific incentives to increase production have often been emphasised, there has been less focus on why specific, spatially restricted intensive solutions have been chosen. Undoubtedly population density has been an important factor in processes of agricultural intensification, but the Boserupian argument is circular; the line of causation in population pressure theory may work backwards (Börjeson, 2007). It fails because it reduces human motivation to simple subsistence needs and treats the environment as spatio-temporally uniform. Within a specifically Eastern African context Håkansson (1989) has critically addressed the limitations of the Boserupian model, and in so doing has spawned considerable debate (Börjeson, 2004a; Börjeson, 2004b; Östberg, 2004; Widgren, 2000; Widgren, 2004; Davies, 2013). Håkansson contrasts the Boserupian model with two others based on the idea that intensification can be more broadly understood as an effect of pressure on production. His first model, the ‘political-economy’ model (1989: 15), argues that chiefly demands for surplus acted as impetus to intensification. This model supposes the existence, pre-intensification, of chiefly elites whose demands for surplus drove intensification. However, this is currently clearly not the case among societies such as the Pokot, Marakwet, Il Chamus, Sonjo and Iraqw where agriculture is primarily organised on a clan and lineage basis lacking any form of chiefly authority (Widgren, 2000: 263; Widgren, 2004: 15). Indeed, Håkansson (1989: 17) himself notes that even among the chiefly Chagga of Kilimanjaro the irrigation system is controlled on a lineage and household, rather than a chiefly, basis. In later work on Pare, Håkansson (1998: 265) actually shows how intensification, stimulated by exchange, leads to the fragmentation of chiefly power, while Håkansson and Widgren (2007) find no direct correlation between intensification and social hierarchy in northern Tanzania. Moreover, as noted in the previous section, the major fundamental flaw with this model, in its current formulation, is that it fails to account specifically for why surplus demands require intensive production when they might be fulfilled in a variety of ways (i.e. by expansion or conquest/theft). Håkansson’s second model sees commercial development and access to markets as a key impetus to agricultural intensification. However, while the development of markets and favourable terms of exchange has clearly played a role in the development of many intensive agricultural systems, such as at Baringo (Anderson 1988; Anderson, 1989; Anderson, 2002), northern Tanzania (Håkansson and Widgren, 2007) in the 19th century, and more recently among the Machakos (Tiffen et al., 1994), many of the societies practising intensive agriculture in Eastern Africa exist in relative isolation from large formal markets (Widgren, 2000: 263; Widgren, 2004: 16). Moreover, while formal market trade has certainly been important, exclusive focus on such may be misleading. For example, the role of the 19th century caravan trade in establishing a large formal market outlet for agricultural produce in the Baringo area clearly stimulated intensification. However many Il Chamus were clearly also motivated by the opportunity to rebuild their herds so as to return to pastoralism and the initial shift to agriculture likely occurred before the advent of the caravan trade. As such, agricultural intensification here cannot be abstracted from the more general regional networks of trade and exchange that stimulate production in the region and which predate the caravan trade. A similar argument might be put forward for the agricultural Arusha Maasai (Spear, 1993: 131; Spear, 1997: 3), while Håkansson (1998: 270) sees extensive regional trade in Pare as stemming from the early 18th century and the arrival of highly specialised pastoralists in the region. Here, the advent of the caravan trade taps into and intensifies existing exchange networks which had already stimulated increased agricultural production (see also Sheridan, 2002: 83). That is not to say that the establishment of extensive regional trading patterns are not important, especially those related to the slave and ivory caravans of the 19th century (Håkansson, 2004; Håkansson, 2008; Håkansson and Widgren, 2007), but rather that there are also broader, ongoing, and deeper-time processes of exchange and interaction between economically specialised groups and across ecotones that existed before and alongside more formal global trading networks (Håkansson and Widgren, 2007: 239, 245). The advent of the 19th century caravan trade ‘piggy-backs’ these pre-existing relationships, hence a considerable range of ‘intensive systems’ considerably pre-date the 19th century and/or have no evidence of being connected to extensive external trade networks. A third model, following Carneiro’s wider circumscription theory and often termed the ‘siege hypothesis’, has also found some support (Gourou 1991, cited in Widgren, 2004: 14). This theory builds on the Boserupian model by seeing intensification as the result of stress on resources following some form of political unrest. Groups are seen as circumscribed into limited areas as the result of conflict—the pressure being exerted on Eastern African agriculturalists generally being thought to come from surrounding pastoralist groups (Börjeson, 2004b: 70–82; Östberg, 2004: 24; Widgren, 2004: 13). While conflict between pastoralists and agriculturalists has clearly had a major impact on the development and distribution of intensive agriculture in Eastern Africa, it fails as a single causal factor on a number of counts, including its overt emphasis on stress to the exclusion of factors such as markets or political centralisation, and its focus on the interaction between agriculturalists and pastoralists as purely antagonistic, despite a growing body of literature on the various amicable exchange relations between them (Widgren, 2004: 14; also see below). Though the Iraqw of north central Tanzania have long been viewed as a classical example of the siege hypothesis, Börjeson (2004a: 157–158; 2004b: 102) has eloquently deconstructed the applicability of the model, demonstrating that it is based upon a series of assumed causal links between population pressure and agricultural intensification which cannot be sustained. Essentially the siege hypothesis suffers from problems similar to those of the more straightforward Boserupian model, namely that the line of causation may work backwards. As Börjeson hints, and as I develop more forcefully in the following sections, the existence of specialised pastoralists does, to some extent, constrain agricultural groups through the need to engage in pastoral exchange networks. However, this does not specifically prevent mobility, nor does it necessarily result in population pressures significantly high enough to explain agricultural intensification alone. While attempting to avoid the trap of environmental determinism, it seems pertinent to explore in greater detail some of the common geographical characteristics of the intensive agricultural systems outlined above. Nearly all of these systems exist within, or at the margins of, isolated highland areas (Taita, Kilimanjaro, Meru/Arusha, Pare, Usambara, Iraqw), or on the margins of larger highland massifs (Konso, Pokot, Marakwet, Engaruka). These areas are highly dissected topographically, with numerous water courses and steep-sided valleys. This topography lends itself well to both hillside terracing and canal (or ‘hill furrow’) irrigation, and clearly there are functional and environmental constraints on the geographical areas in which it is possible, or likely, for certain forms of intensive agricultural practice to be found. Of most importance are major variations in vegetation, soils, and climate over relatively short distances (Fleuret, 1985: 105; Kurita, 1983: 74). These agricultural societies exploit ecotonal environments at the boundaries between areas suitable for lowland pastoralism and highland rain-fed agriculture. Consequently, all of the agriculturalists considered here are in close contact with low-land pastoralists. These ecotonal locations allow for interaction between pastoral and agricultural modes of production enacted through various institutionalised cross-ethnic/cross-economic ties based on inclusive cross-cultural categories (age-grades, marriages, stock and other friendships, various ceremonies etc.) (Loiske 2004; Spear, 1993: 120; see also Bollig, 1998; Conant 1965; Conant, 1966; Hodder, 1982; Kurita, 1983; Östberg, 2004; Pollard et al., in press). Importantly, it is these institutionalised networks that provide the matrix within which agricultural intensification occurs. Agriculturalists demand a variety of pastoral products that can be acquired in return for agricultural goods and the vast extent of this exchange is well documented (Beech, 1911: 17; Håkansson, 1994; Hodder, 1982: 39–64; Östberg, 2004: 28–29). Kurita (1983) and Pollard et al. (in press) have analysed in detail the extent of agricultural–pastoral exchange at market places in the in the Kerio Valley at the foot of the Elgeyo escarpment including Chesegon and Tot. These markets facilitate extensive formal trade between the agricultural Pokot and Marakwet and the pastoral Pokot. But this market exchange is also underpinned by wider regional exchange networks based on deeper socially proscribed reciprocal exchanges involving livestock and agricultural produce and existing between both men and women (Pollard et al., in press). Schneider (1957) for example has documented the socially prescribed uses of livestock and the intricate institutionalised exchange relationships that interlink agricultural and pastoral Pokot communities. He argues that goats and sheep are used by both groups in an informal way, as a form of small-currency, exchanged in return for various goods including, grain, agricultural labour, metal tools and ceramics. They also play an important role as an adjunct to cattle in marriage payments. On the other hand cattle, particularly Ox steers, are used in a more formal manner, especially within the context of a number of similar ceremonial feasts (though goats may be used as a surrogate). The most elaborate form of this feast is that of the sapana initiation in which a steer is ritually slaughtered by the initiand and distributed to the community (Peristiany, 1951). Livestock sacrifice is essential for the maintenance of both communal and individual wellbeing. Whenever misfortune occurs (i.e. during illness, drought etc.) or is threatened (during life cycle rituals; initiation, birth, marriage, death), access to, and subsequent sacrifice of livestock is essential for the pacification of the supernatural order. As Bollig (1998: 141) has documented, many of these rituals involve individuals being chosen to donate and spear an ox. Importantly, such rituals create a bond of reciprocity between donor and spearer. The donor is able to stipulate how and when the ox should be repaid by the spearer and further exchanges may follow—a situation that creates privileged access to alternate production systems. The most important livestock relations, however, are based on kinship—marriage payments, and stock-friendships (Schneider, 1957; Zaal and Dietz, 1999: 175). The institution of the stock-friendship, tilia, is not only the loaning of cattle so as to spread risk in case of theft, drought or disease; it is also based on the differing value of cattle and their socially prescribed consumption. Tilia involves the mutually beneficial exchange, between non-kinsmen, of a Ox steer (or grain) for a cow. The donor of the cow normally requires a Ox steer either for sacrifice or to exchange for grain, while the donor of the steer usually requires the reproductive and milk-producing benefits of a cow. However, the receiver of the cow (which is more ‘valuable’) cannot kill or dispose of it and is obliged to return a number of the calves to the original owner. Tilia thus marks the beginning of close and ongoing relations between the partners. They are supposed to support each other in disputes and crises and continue to exchange gifts of goats and beer (Schneider, 1957: 284–285). Through tilia, agricultural Pokot and Marakwet are able to obtain ongoing and ready access to livestock, while pastoralists are able to obtain a ready supply of grain. Informants among the agricultural Pokot and Marakwet attest to the continuation of these practices up to the present, while acknowledging that they were formerly more widespread (see also Zaal and Dietz, 1999). Pollard et al. (in press) have further documented the extensive existence of female tilia relations between the Marakwet and Pokot which extend across ethnic and economic boundaries linking pastoral and agricultural communities. Marriage and the distribution of bridewealth establish similar relations (see below), while obligations between kin and age-mates are also similar and both often act to link pastoral and agricultural communities (Schneider, 1957: 285–286; see below). Common age-set systems and shared initiations in particular act as a starting point for the formation of other economic interactions across ethnic and economic boundaries. Kipukat, on the other hand, is a more direct form of balanced reciprocity in which a steer (often already butchered) is exchanged directly for grain with no long-term relationship or obligations (Schneider, 1957: 285). A number of informants among agricultural sections of the Pokot have told me that this practice was common in the past, particularly at harvest time and during various major ceremonies, when many pastoralists would venture up into the Tamkal Valley to exchange meat and milk for grain directly. Such networks also extend into neighbouring communities and similar institutions are far from unique to the Pokot. Östberg (2004: 28) recounts narratives of Marakwet trade with pastoral Turkana to the north during the early parts of the 20th century. These trade expeditions involved tobacco and grain from Marakwet being exchanged for goats, salt-lick and soda (for snuff), which was then traded on by the Marakwet to the south along the Kerio Valley. Östberg (2004: 30) and Hodder (1982: 23) also found that ‘cattle friends’ linking Pokot, Marakwet and Tugen were common throughout the Kerio Valley and the Baringo region. Moreover, as will become more apparent in the following discussion, similar cross-ethnic/economic exchange relations have been documented for a number of other regions (Loiske, 2004: 109; Sheridan, 2002: 82; Spear, 1993; Spear, 1997). What this case-study briefly emphasises are the intricate ways in which exchanges with pastoralists are an essential component of many Eastern African agricultural societies. Livestock–grain transactions are not only important for subsistence, but are also integral to the maintenance of social and ideological world views where they act as a means of transferring and symbolising obligation, alliance, trust and friendship. This example also outlines some of the social mechanisms, socially proscribed ‘institutional networks’, which ensure the ready flow of goods (particularly livestock and grain) and people between different economic zones. The following discussion aims to situate this example within its broader regional and theoretical context. Håkansson argues that capital can be built up in the form of livestock and transferred into capital based in human relationships. Bridewealth payments have allowed men to accumulate wives and legitimate children whose labour can be controlled and used to further increase productivity. Numerous wives, children and grandchildren add to one’s social prestige, standing, and influence within the community while strategic stock loans can be made to both relatives (affinal and agnatic) and unrelated individuals, establishing relationships of indebtedness and thus dependency which can be used to further build support and power (Håkansson, 1994: 250). The ability to donate stock for various ritual activities (including marriage payments, initiations, blessings, healings etc.) can further act to increase an individual’s social standing. Moreover, given a crisis situation, such debts and reciprocal networks can be called in and destitution avoided. Stock accumulation and/or the ability to acquire and distribute stock thus act as both a power and prestige-building activity and as a risk aversion strategy. In essence, the acquisition and socially prescribed redistribution of livestock (through bridewealth payments, formal stock loans, ritual/ceremonial donations) is a process of building ‘symbolic capital’ (Bourdieu, 1983) which can be thought of as ‘social-credit’ built through the performance of an ‘ostensibly public good that establishes indebtedness which in turn supports positions of social power’ (Håkansson, 1998: 265). The building and maintenance of symbolic capital or ‘legitimacy’ thus requires the investment of economic capital, and throughout much of Eastern Africa this primarily takes the form of investing in and manipulating social relations mediated through livestock (see also Comaroff and Comaroff, 1990; Schneider, 1957: 285).4 Power-building strategies among many Eastern African agriculturalists thus require ready access to livestock and, just as power-building through livestock transactions is channelled along socially prescribed pathways, so access to livestock is conditioned by socially prescribed relationships (i.e. kinship, affinity, age-sets, stock friendships, formal barter). Importantly, these formal exchange relationships involve specific obligations that ensure maintained access to alternative productive systems and the continued reproduction of Eastern African life-ways. Within this system of donations, exchanges and loans, the reciprocal nature of accumulated human capital and agricultural intensification is clear. For many Eastern African agriculturalists, power building occurs through the transformation of agricultural labour into relationships of dependency/social-credit via exchange transactions involving livestock. Labour resulting from these relationships of dependency may then be reinvested in the creation of agricultural infrastructure which further act to increase one’s potential for livestock accumulation and improves one’s chances of surviving crises (Håkansson, 1998: 274). Given the specialised and reciprocal nature of agricultural and pastoral production, and the role of livestock as a primary form of transformational capital, there is then a strong impetus towards increased agricultural productivity around the pastoral margins. In other words, agriculturalists who are intricately entwined with the pastoral economy due to their ideological dependency on livestock can become confined to relatively circumcised areas—the pastoral fringe—where they increase production through intensification so as to improve their access to livestock based exchange networks (Håkansson, 1994: 270–271). In many cases, the requirements and interpersonal relationships of cross-economic exchange have encouraged and facilitated the occasional movement of groups and individuals across ethnic/economic boundaries (Östberg, 2004: 31; Spear, 1993: 125). At times these shifts have been large-scale, involving whole groups and largely resulting from some economic crisis, though they likely represent an extreme within a pattern of more general and continuous cross-ethnic/economic interaction and movement based on intermarriage and other alliances (Kioko and Bollig 2015). The incorporation of various pastoralists into Il Chamus society and of the Arusha Maasai into irrigation agriculture following the Loikop wars of the 19th century are good examples of this large-scale movement (Anderson, 1988, Anderson, 1989; Spear, 1997: 2). Moreover, these transitions and the agricultural technologies subsequently deployed were facilitated by close and ongoing relationships with surrounding agricultural peoples (Anderson, 1988: 248; Spear, 1997: 49; Waller, 1988: 94). Relatively large population movements would have acted to increase localised and periodic population densities and the result would have been the increase of agricultural production through both the intensification of existing land (based upon new influxes of labour) and the expansion of agricultural land around the fringes of existing pastoral areas. Assimilation of refugees into existing farming communities facilitated further control over labour in the short term, while in the longer term many lineages in various societies can trace their origins back to outside groups (Östberg, 2004: 30; Spencer, 1998: 137–139; personal observation). This process, however, is not one-way. Haaland (1969) famously drew attention to the process whereby Fur agriculturalists may become Baggara herders and it has since become clear that this is a widespread practice. Indeed, this shift from agriculture to pastoralism is driven by high economic investment in livestock, based on their pivotal role as a primary form of transformational capital, and might be viewed as an extreme result of increased agricultural production. Among the societies considered here the shift of Il Chamus into agriculture and then back to pastoralism represents only the best documented and most dynamic example of more general ongoing practice. This might be considered as a series of regional cycles operating at fluctuating rates—whereby successful agriculturalists move into pastoralism at the same time that unsuccessful pastoralists move into agriculture. Perhaps the best example (yet to be explored in detail) is that of the Pokot, who have expanded into pastoralism from their agricultural homeland over at least the last 300 years while, at the same time, probably absorbing refugees from other areas as testified by their clan oral histories (Davies, 2009). Similar situations have also been recorded elsewhere; indeed Jacobs (1968 cited in Anderson, 1988: 249) described Sonjo as a breeding ground for new Maasai. The Arusha and Meru communities have also absorbed and acted to spring-board people of various ethnolinguistic origins back into pastoralism (Spear, 1997: 52). Cross-ethnic marriages are highly important here. They not only play an integral part in lubricating the exchange relations that drive increased agricultural production, they also form an integral part of the exchange cycles themselves which involve not only agricultural produce and livestock but also marriage partners. Kurita (1983: 66) has documented the extent of intertribal marriage at Chesegon in Marakwet, showing that on average over 20% of wives among the Pokot and Marakwet come from different ethnic groups. Similarly, Conant (1965: 432; 1966: 507) found that around 20% of wives among pastoral sections of the Pokot originated from agricultural areas, while Hodder (1982: 23) found a comparable pattern in the Baringo area. In greater detail, Spear (1993: 123; 1997: 52) has documented the dynamic marriage and cattle exchange relationships between pastoralists and agriculturalists. The directional flow of wives and cattle between the Arusha and the Kisongo was dependent upon the current economic status of the partners. During productive periods the pastoral Maasai took Arusha women, which increased their labour potential and rid them of excess cattle. At the same time, the Arusha gained cattle needed for marriage, affinal links to pasture, and the resources to move back into pastoralism. During periods of low pastoral production, Arusha cattle (which were generally insulated from the worst of the epidemics and climatic troubles inflicting pastoral regions) could be exchanged, along with grain, back into the pastoral sections in return for brides and dependent women and children. This reduced excess pastoral labour and provided a mechanism through which to reconstitute herds. For the Arusha, the Kisongo represented an extra supply of labour, which could be used to increase agricultural production and accrue debts among pastoralists that might be repaid at a later date. These movements of people are an important aspect of the population dynamics which form at the boundaries of semi-arid areas (Mace, 1993). In particular, it is clear that at times of individual or community crisis, impoverished pastoralists are able to find refuge within agricultural communities and that these communities may then turn their attention towards reconstituting their herds and shifting back into pastoralism (Anderson, 1988; Anderson, 2002; Spear, 1993: 122; Waller, 1988: 98) an argument that has also been made for Engaruka (Westerberg et al., 2010). The immediate result is the development of localised population pressures around pastoral areas and the increase of agricultural production at the pastoral margins. Agricultural societies within or around semi-arid areas have thus been shaped by the incorporation of refugees and spouses from other societies and the localised population pressures that have led to the development of intensive agricultural practices cannot be divorced from these regional processes of exchange, refuge and incorporation. In this model, the common perception of antagonism between agricultural and pastoral communities is reduced merely to a balancing mechanism whereby conflict ensures that farmers are unable to accumulate large herds and pastoralists are unable to settle with such. Conflict and stock raiding ensure that specialised but inter-transitional specialisms are a more effective economic model than a more broadly based agro-pastoralism. While the cross-ethnic movements described here show that in practice the divide between pastoralism and agriculture is fluid, the effect of raiding ensures that the ideological divide remains strong, for one cannot easily maintain large herds and cultivate intensively. The threat of cattle raiding ensures that individuals must make pragmatic decisions, based on their socio-economic status, over whether to remain agriculturalists or turn to pastoralism. Of most importance to this study, the threat of cattle raiding ensures that capital investments in land prove one of the most pragmatic solutions to farmers who lack the desire or ability to shift into pastoralism but retain strong aspirations to improve their status. We thus need to view pastoralism as a dynamic and adaptable survival strategy within which there is a degree of flexibility to shift into and out of agricultural practices. The result is the concentration of farming communities either around the pastoral margins or as ‘islands’ within them. Agriculturalists in these areas remain tied to pastoral networks through which they acquire livestock and dependent labour (through marriages and clientage) and they increase productivity to do so. Pastoralists, on the other hand, require agricultural food-stuffs and refuge as important survival mechanisms. The very nature of these agricultural areas, situated at the pastoral margins, ensures that expansion of farming is ecologically constrained, while periodic shifts of pastoralists into agriculture create localised population pressures, as well as providing excess labour that can be turned into landesque capital. This symbiotic ‘agricultural–pastoral’ relationship, based on institutional socially proscribed networks, such as those of the Pokot explored above, creates localised population densities and localised resource pressures which, combined with an ideology of livestock as essential transformational capital, ensures a strong impetus towards increased agricultural production at the pastoral fringe. As argued above, areas of intensive agriculture in Eastern Africa are concentrated along the margins of pastoral areas or situated as islands within them—the strong link with the pastoral mode of production ensures that expansion away from the pastoral zones, perhaps even into more fertile areas, is achieved only through the loosening of one’s ties to the pastoral exchange network (Håkansson, 1994: 270–271). As such, expansion represents a compromise which may result in decreased access to prestige forms of capital such as livestock as well as to sources of labour. The consequence is the existence of large populations within relatively constrained areas and with resources at a premium. Population pressure is thus crucial to the process of intensification. However, unlike the Boserupian model which implicitly sees agricultural intensification as motivated by the combination of population pressure and subsistence needs, this model views exchange dynamics coupled with resource distribution as key to explaining both population pressures and the shift to intensification; Boserup is somewhat reversed. Of interest here is Sherratt’s (1980) model of Old World agricultural development. Sherratt suggests that early agriculture, rather than being swidden-based (as the Boserupian evolutionary scheme proposes), is at least as equally likely to have been adapted to intensive sedentary cultivation of riverine and lacustrine conditions. The model posits that early agriculture would have been small-scale horticulture utilising restricted areas of fine-grained water-retentive soils able to support sparsely distributed but relatively high density settlements. The naturally high groundwater conditions of these alluvial and lake-side environments would have favoured intensive garden type cultivation with small plots worked by hand and, given high soil potentials, used continuously without fertilisation or fallowing. Within this model very little soil preparation would be required, necessitating only the use of simple hoes or digging sticks, with minimal labour-costs (see also Farrington, 1980: 288). In support of this model, and contrary to expectations generated by the Boserupian trajectory, Neolithic sites throughout Europe and the Near East were usually long-lived, often lasting for hundreds of years. Moreover, settlement surveys of European and Near Eastern Neolithic sites seem to confirm a restricted distribution of agricultural sites as confined to high quality and well watered alluvial, colluvial and loess soils, on flood plains or the lower parts of the valley slopes with some expansion to similar positions within small side-valleys (Sherratt, 1980: 315; see also Bar-Yosef et al., 1992: 38; Hodder, 1990: 48–50; Miller, 1980; Scarre, 2005; Sherratt, 1997: 256–286; Smith, 1995: 74–102; Watkins, 2005; Van Andel and Runnels, 1995). The implication of these archaeological data is that early agriculturalists occupied only narrow zones of maximum potential. Most importantly, Sherratt sees the development of irrigation agriculture as a simple artificial extension of early farming. While intensive irrigation-based agriculture is often viewed as a major departure from earlier forms, involving a radical change in techniques, Sherratt’s model sees a much more continuous pattern of development through small additional inputs of labour and capital. Given the relatively low labour-costs of agriculture on fertile, well-watered soils, labour investments in forms of landesque capital would have been more easily accommodated. At the same time, expansion of rain-fed cultivation onto areas of more marginal soil, necessitating land clearance and labour intensive soil preparation, may be viewed as highly costly and less likely to take place. Archaeological evidence further corroborates this contention. Various complicated water management techniques seem to be characteristic of Near Eastern villages from at least the late Neolithic onwards, with the earliest demonstrated examples of irrigation being related to the braided mountain streams that flow down the alluvial fans on the margins of lowland semi-arid basins (Sherratt, 1980: 322; see also Miller, 1980; Watkins, 2005). This description is remarkably similar to areas of Eastern Africa, such as Marakwet/Pokot (Soper, 1983) and Engaruka (Sutton, 2000: 204), where irrigation allows for the cultivation of alluvial outwashes at the base of escarpments. In other areas, such as parts of Pokot (personal observation), Sonjo (Adams et al., 1994), Iraqw (Börjeson, 2004b: 76), Taita (Fleuret, 1985: 105), and Kilimanjaro (Grove, 1993: 431), irrigation is employed within highly dissected landscapes involving numerous well watered valleys. I argue then that intensive agriculture in East Africa should be viewed in the heuristic light of Sherratt’s model. Initial agriculture in semi-arid pastoral areas likely clustered in riverine environments on naturally high potential well-watered soils. Expansion to higher altitudes, involving major forest clearance may have been a secondary or contemporary development, perhaps coinciding with the introduction of metal tools to the region some 2500–2000 years ago and extending into the 20th century. In this scenario small-scale agriculture, utilising limited fine-grained, high potential soils, with short fallow periods, and perhaps making use of proto-intensive techniques (Figure 3D),5 has a long established history which may predate (or have existed alongside) the first long-fallow, rain-fed, agricultural forms which became common throughout the region. The development of irrigation and terracing throughout the region might therefore be seen in relation to this early form of cultivation. I would posit an initial naturally unequal distribution of resources in which those with access to land nearest water courses, flatter valley bottoms and colluvial/alluvial deposits were able to produce much higher yields, providing them with better access to exchange networks. As population densities increased, more marginal agriculture may have been practised away from these primary areas of high potential land, but this would have provided much lower yields. The choices open to individuals facing this situation would be twofold. They could cultivate larger areas of this more marginal land, which would be highly labour intensive and perhaps not even possible, or they could make capital investments in a more limited area of land. Clearly, for many people, the second option was highly viable. In this scenario initial irrigation would have been small-scale and localised, but, as technologies were perfected and as the system grew, whole groups would have come to realise the potential of larger scale irrigation and more substantial hillside terracing, resulting in major construction projects. Expansion to higher altitudes would also have gradually occurred based on a compromise between reducing access to pastoral exchange networks but facilitating higher yields that could be used to better maintain direct or down-the-line exchange relations. The clustering of agricultural land around water courses would have resulted in a layering of field systems with decreasing natural productivity related to distance from the water course. This layering would have constrained the agricultural expansion of those individuals cultivating fields towards the centre of the system and, as demands on production for exchange increased, those at the centre would also be motivated to intensify. The operation of a lineage system of land tenure would further have exacerbated this situation. Shipton (1984a: 124; 1984b: 618) has considered the way in which lineage-based systems of land tenure operate. He argues that within descent-based systems fields are generally laid out in extendable parallel strips with each strip being owned by a lineage or lineage section. Land is generally scarce and expansion can only be achieved through gradual encroachments onto the land of genealogically adjacent groups. On the death of a land holder holdings are subdivided among all sons so that brothers occupy adjacent holdings. The constant division of limited areas of land between brothers ensures that there are localised pressures on the best land, providing a further impetus to intensify. This lineage division of land is clearly the case among the Pokot, where the social structure inherently creates localised population pressures and this can be viewed in settlement patterns which shift across the landscape and create repetitive patterns of clan land-holdings (Davies, 2013). At any one time, clan lands are limited and circumscribed by the position of neighbouring clans. Despite the fact that a variety of matrilineal and affinal links can be used to improve access to land, and that various trade-offs can allow one to consolidate widely distributed plots, land remains scarce towards the centre of the agricultural system (around water courses) and increasing production through added inputs of land is often difficult without wholesale movement away from one’s traditional home and the pioneering of new lands. Clearly for many, this situation is unfeasible as it can remove individuals from their important kin support networks and may well be more labour intensive than intensifying relatively limited areas of traditional land. Similar situations also occur in Marakwet (Widgren, 2006), Taita (Fleuret, 1985: 113), Sonjo (Grey, 1963: 47), and Pare (Sheridan, 2002: 85). Moreover, the correspondence between the spatial and genealogical relationships of lineage segments points us towards a key understanding of how these agricultural systems expand through major construction works. As lineage sections expand and diverge, the fringes of the system will be characterised by whole descent groups relegated to poorer lands, placing them in an unequal position (in terms of agricultural productivity and thus access to exchange networks) vis-à-vis those groups at the centre. This marginalisation of whole and politically unified descent groups allows for the organised construction of major agricultural works such as irrigation canals and the expansion of the agricultural system to more marginal areas. This historical process is evidenced by the lineage-based ownership of major irrigation canals in Pokot (Davies, 2013) and Marakwet (Davies et al., 2014; Soper, 1983; Ssennyonga, 1983). A number of authors have also noted the role of intensive agriculture in providing a buffer or security system at times of crisis (Östberg, 2004: 44). This theory has two major implicit themes which need to be clarified. Firstly, that intensive systems provide surpluses to carry a community through periods of shortage. And secondly that these intensive techniques, particularly irrigation, are more reliable than less intensive techniques and thus act to iron out climatic variability. The first theme is often likely true, but it remains subject to limitations similar to those noted for any simple ‘surplus producing’ model – namely that production can be increased through expansion as well as intensification and thus at another level of explanation it must be shown why specific spatially restricted intensive techniques were adopted. The second theme is also generally true, though it is likely to be a misleading over-simplification to cite ‘reliability’ as the sole motivation in every (or even any) process of intensification (Davies 2013). Production, whether during good or poor climatic periods, cannot be divorced from the economic and population dynamics outlined above. Climatic variability has been a major influence on Eastern African economic strategies over both short and long timescales involving both major trends and rapid fluctuations (Anderson and Johnson, 1988; Gowlett, 1988; Nicholson, 2000; Verschuren et al., 2000). During the last two centuries, for example, major droughts occurred in the 1820s and 1830s, 1880s and 1890s, 1913, the late 1920s and early 1930s, 1970s and 1980s, and early 2000s (Anderson and Johnson, 1988: 12; Nicholson, 1998; Nicholson, 2000). Diamond (2006: 12) has pointed out how societies are likely to increase production (and population) in good years, often without forethought of what might occur during poor years. In this scenario, expansion of farming onto more marginal lands, accompanied by population growth, would occur during favourable climatic periods. Shifts to less favourable conditions would then lead to problems, either resulting in out migration, famine, and/or intensification of existing lands (see also Anderson and Johnson, 1988: 13). Given the importance of ties to regional exchange networks, as well as cultural attachments to place and kin, migration during periods of stress may well seem a less preferable option to intensification. Moreover, any successful, and potentially more reliable agricultural system may act as a centre of gravity attracting more marginal pastoralists and agriculturalists. This may occur under both optimal and suboptimal conditions and result in intensification and expansion of the area under intensive cultivation (Mace, 1993: 370). Of importance, however, is the realisation that initial long-term reliability may not have been the primary concern of the first agriculturalists who developed intensive techniques, but rather the product of more immediate, climatically or economically induced concerns. We might view long-term reliability not as the product of specific foresight but rather as an emergent property or exaptation of a short-term survival or maximisation strategy.6 This is implicit in Sherratt’s model, while Sutton implies a similar scenario for the development of the agricultural works at Engaruka in northern Tanzania. Another misleading assumption of an overt focus on ‘reliability’ or ‘buffering’ is that these intensive agricultural systems are primarily geared towards subsistence production. As widely demsontrate above, except under the most extreme stresses, production is almost always geared towards building social credit through exchange (Håkansson and Widgren, 2007); indeed, it is incorporation into various exchange networks (through surplus production) which likely act as a more important risk reduction strategy at times of crisis. Importantly, a focus on the exchange potential of agricultural societies situated in close proximity to pastoral regions demonstrates how periods of environmental pressure may actually increase their power-building capacities. Given the inherent risks of pastoral production (Bollig, 1998: 138), and the relatively greater reliability of agricultural production, agriculturalists are able to increase their number of dependents as they extend support to impoverished pastoralists (and potentially other agriculturalists). Indeed, even when agricultural communities are under stress themselves they may curb their own subsistence needs so as to build the capacity for increased returns during better times. Motivation to intensify is rarely based purely on fulfilling subsistence needs at times of crisis—but rather is likely based on maximising exchange potential (which is, in its self, a very good survival strategy) under all but the most extreme climatic conditions, even when this strategy is potentially damaging (De Waal, 1989).7 A corollary of this model might then be that (up to a point) even at times of climatic stress, intensive agricultural systems, situated on the margins of pastoral areas, will maintain production and may even expand and/or intensify. The development of intensive agriculture in Eastern Africa has involved the complex interaction of both socio-cultural and environmental factors. The attempt here has been to highlight the complex interplay of broad ecological and social trends that have influenced the development of intensive agriculture. The specific roles of significant historical events such as wars, droughts, epidemics and extra-regional trade links, are beyond the scope of this article, but also warrant consideration in terms of explaining the specific conditions in any one region. What is clear is that simple monocausal models such as population pressure or siege do not fully account for the complexity of agricultural forms found throughout the region. Distinct environmental variation, within relatively short distances, and in collaboration with climatic fluctuations, encourages economic specialisations (farming and herding) which are reliant upon one another. Contact between different economic/ethnic groups is facilitated by a variety of culturally prescribed institutionalised networks which encourage the movement of both goods and people across boundaries and the clustering of people at those boundaries. The important role of livestock as essential capital among Eastern African agriculturalists ensures a strong impetus to increase agricultural production so as to acquire livestock. The need to acquire livestock through ties to the pastoral community ensures that certain agriculturalists are confined to the relatively limited areas at the margins of pastoral zones—at the boundaries between specialised modes of production. Agricultural communities at this pastoral fringe act as a fall-back or refuge community for impoverished pastoralists and have the potential, through turning agricultural produce into livestock, to springboard individuals or groups into pastoralism. At the pastoral fringe wide variations in elevation and topography, with relatively narrow zones of high potential well-watered soils, ensures limited access to the most productive land—creating additional localised population pressures resulting in intensified agricultural production at the pastoral margin. In contrast to traditional models of agricultural development (based on the Boserupian evolutionary model), the shift to intensive techniques may not be a radical departure from earlier practices, but rather much less labour intensive and gradually developed, aimed at expanding and improving natural zones of high productivity. Given lineage systems of social organisation with constant division of landholdings, there will be a layering of field systems with decreasing productivity towards to margins. Such a situation encourages the marginalisation of politically unified descent groups and facilitates the development and expansion of largescale agricultural works (particularly irrigation canals) aimed at improving the productivity, and thus exchange potential, of agricultural outliers. While population pressure and conflict are important in the development of intensive agriculture in Eastern Africa they are both the result of the complex interactions between agriculturalists and pastoralists. These in turn are influenced by the nature of the Eastern African environment, particularly major variations in elevation, topography, soils and vegetation, and somewhat predictable fluctuations in climate and political fortunes. Intensive agricultural practices might then be best seen, not as the product of monocausal population pressure, conflict, tribute demand, or formal market exchange, but as the outcome of tried and tested patterns of ecological response enacted by both herders and farmers and aimed at maximising access to a variety of resources within a challenging mosaic environment. 1Another issue to consider is the alternate (i.e. non-agricultural) labour saving advantages of intensive techniques. For example, irrigation water is often used for domestic purposes, thus producing massive savings by reducing labour expended in water collection (Fleuret 1985: 109; Grove 1993: 349). 2Island environments constitute the classic case, while the ‘siege hypothesis’, as outlined below, constitutes another. However, as I shall show, there are other less obvious factors, such as exchange networks and resource distribution that constrain populations into circumscribed areas. 3While livestock and agricultural goods remain the primary commodity in these exchange systems, the importance of other goods should also be considered including beer, honey, metal work and pottery. 4The role of women in this process is far from passive. Wives acquire livestock which can be used for the bridewealth of their own sons and as such women are able to attain high levels of prestige (symbolic capital) as successful mothers and grandmothers (Håkansson 1994: 260). 5Proto-intensive techniques might include very simple small-scale irrigation, or simple trash terracing which have gradually developed into the techniques that we see today (see Figures 2E and 3D). 6This is not to deny that Eastern African farmers lack considerable foresight; indeed, the scale of major agricultural works, particularly large irrigation canals, is a clear indication of this. However, it seems unlikely (if not impossible) that initial shifts towards intensive techniques occurred on such a scale. Rather I should imagine that such techniques were gradually accumulated through time and experiment – with smaller scale constructions preceding larger ones (Sutton 2000: 211). 7DeWaal (1989: 112–171) has explored in detail the various motivations and networking strategies employed during a period of extreme environmental stress in Darfur during the 1984–85 famine. This work has a long history. It began as a masters thesis under the supervision of Peter Mitchell. It has subsequently been revised several times with input from multiple colleagues. Thanks must go to the institutions that have supported me across that time, especially the British Institute in Eastern Africa, St Hugh’s College, University of Oxford and the McDonald Institute at the University of Cambridge. Work on the Pokot was facilitated by a doctoral award from the UK Arts and Humanities Research Council and permission was kindly granted by the Kenyan Ministry for Science and Technology (MOEST 13/001/35 C 592/2). Additional funding was received from the Meyerstein fund University of Oxford, the Tweedie Exploration fund and the British Institute in Eastern Africa. The National Museums of Kenya have also been a great support throughout. My wife Laura and my great Kenyan colleagues and friends have offered a wonderful network of encouragement and a source of ideas. Mats Widgren has spent the last decade pestering me to publish this article and his ideas and insight have contributed greatly to its final form. That said, any mistakes or faults are entirely my own. Adams, W. M. (1996). Irrigation, erosion and famine: visions of environmental change in Marakwet, Kenya In: Leach, M. and Mearns, R. eds. The lie of the land: Challenging received wisdom on the African environment. Oxford: James Currey, pp. 155–167. Adams, W. M. and Anderson, D. M. (1988). Irrigation before development: indigenous and induced change in agricultural water management in East Africa. African Affairs 87: 519–535. Anderson, D. M. (1988). Cultivating pastoralists: ecology and economy among the Il Chamus of Baringo In: Johnson, D. H. and Anderson, D. M. eds. The ecology of survival: case studies from northeast African History. London: Lester Crook Academic Publishing. Anderson, D. M. (2002). Eroding the commons: the politics of ecology in Baringo, Kenya 1890s–1963 In: Oxford: James Currey. Anderson, M. and Johnson, D. H. (1988). Introduction: ecology and society in Northeast African history In: Johnson, D. H. and Anderson, D. M. eds. The ecology of survival: case studies from Northeast African history. London: Lester Crook Academic Publishing. Bar-Yosef, O. and Belfer-Cohen, A. (1992). From foraging to farming in the Mediterranean Levant In: Gebauer, A. B. and Price, T. D. eds. Transitions to agriculture in prehistory. Madison: Prehistory Press, pp. 21–48. Beech, M. W. H. (1911). The Suk: Their language and folklore In: Oxford: Oxford University Press. Boserup, E. (1965). The conditions of agricultural growth In: London: Allen and Unwin. Börjeson, L. (2004a). A history under siege: intensive agriculture in the Mbulu Highlands, Tanzania, 19th century to the present In: Stockholm: Acta Universitatis Stockholmiensis. Börjeson, L. (2004b). The history of Iraqw intensive agriculture, Tanzania In: Widgren, M. and Sutton, J. E. G. eds. Islands of intensive agriculture in Eastern Africa. Oxford: James Currey, pp. 68–104. Brookfield, H. C. (1972). Intensification and disintensification in Pacific agriculture a theoretical approach. Pacific Viewpoint 13: 30–48. Brookfield, H. C. (1984). Intensification revisited. Pacific Viewpoint 25: 15–44. Clark, C. and Haswell, M. (1970). The economics of subsistence agriculture In: London: Macmillan. Davies, M. I. J. (2009). An applied archaeological and anthropological study of intensive agriculture in the Northern Cherangani Hills, Kenya. Doctoral dissertation, University of Oxford, Oxford. Davies, M. I. J. (2013). Forced moves or just good moves? Environmental decision making among Pokot farmers, northwest Kenya In: Davies, M. I. J. and M’Mbogori, F. M. eds. Humans and the environment: new archaeological approaches for the 21st century. Oxford: Oxford University Press, pp. 57–76. Davies, M.I. J. (2014). The temporality of landesque capital: farming and the routines of Pokot life In: Håkansson, T. and Widgren, M. eds. Landesque capital: the historical ecology of enduring landscape modifications. Walnut Creek: Left Coast Press Historical Ecology series, pp. 172–196. De Waal, A. (1989). Famine that kills: Darfur, Sudan 1984–1985 In: Oxford: Clarendon. Diamond, J. (2006). Collapse: how societies choose to fail or survive In: London: Penguin. .
Feierman, S. (1990). Peasant intellectuals: anthropology and history in Tanzania In: Madison: University of Wisconsin Press. Geertz, C. (1963). Agricultural involution: the process of ecological change in Indonesia In: Berkley: University of California Press. Gleave, M. B. and White, H. P. (1969). Population density and agricultural systems in West Africa In: Thomas, M. F. and Whittington, G. W. eds. Environment and Land Use in Africa. London: Methuen, pp. 273–300. Gourou, P. (1991). L’Afrique tropical, nain ou géant agricole? In: Paris: Flammarion. Gowlett, J. A. J. (1988). Human adaptation and long-term climatic change in northeast Africa: An archaeological perspective In: Johnson, D. H. and Anderson, M. eds. The ecology of survival: case studies from Northeast African history. London: Lester Crook Academic Publishing, pp. 27–46. Gray, R. F. (1963). The Sonjo of Tanganyika: an anthropological study of an irrigation-based society In: International African Institute: Oxford University Press. Grigg, D. B. (1976). Population pressure and agricultural change. Progress in Geography 8: 135–176. Grove, A. (1993). Water use by the Chagga on Kilimanjaro. African Affairs 92: 431–48. Gulliver, P. H. (1955). The family herds: a study of two pastoral tribes in East Africa, the Jie and Turkana In: London: Routledge and Keegan Paul. Haaland, G. (1969). Economic determinants in ethnic process In: Barth, F. ed. Ethnic groups and boundaries: the social organization of culture difference. Boston: Little, pp. 58–73. Hallpike, C. R. (1972). The Konso of Ethiopia: A study of the values of a Cushitic people In: Oxford: Clarendon Press. PMCid: PMC494052. Hennings, R. O. (1951). African morning In: London: Chatto and Windus. Herskovits, M. J. (1926). The cattle complex in East Africa. American Anthropologist 28: 230–272, DOI: https://doi.org/10.1525/aa.1926.28.2.02a00030 361–380. Hodder, I. (1982). Symbols in action: Ethnoarchaeological studies of material culture In: Cambridge: Cambridge University Press. PMid: 7129744. Hodder, I. (1990). The domestication of Europe: Structure and contingency in Neolithic societies In: Oxford: Blackwell. Hollis, A. C. (1905). The Masai: their language and folklore In: Oxford: Oxford University Press. PMid: 19601180; PMCid: PMC2222340. Håkansson, N. T. (1994). Grain, cattle and power: social processes of intensive cultivation and exchange in precolonial western Kenya. Journal of Anthropological Research 50: 249–76. Håkansson, N. T. (1995). Irrigation, population pressure, and exchange in pre-colonial Pare, Tanzania. Research in Economic Anthropology 16: 297–323. Håkansson, N. T. and Widgren, M. (2007). Labour and landscapes: the political economy of landesque capital in nineteenth century Tanganyika. Geografiska Annaler. Series B. Human Geography, : 223–248. Håkansson, N. T. and Widgren, M. (2014). Landesque capital: the historical ecology of enduring landscape modifications In: Walnut Creek, CA: Left Coast Press. Håkansson, T. (2008). The decentralized landscape: regional wealth and the expansion of production In: Cliggett, L. and Pool, C. A.. eds. Economies and the Transformation of Landscape. Rowman: Altamira, pp. 239–266. Johnston, H. H. (1886). The Kilimanjaro expedition In: London: Kegan, Paul and Trench. Kurita, K. (1983). A preliminary report on the economic activities of the Pokot and the Marakwet In: Kipkorir, B. E., Soper, R. C. and Ssennyonga, J. W. eds. Kerio valley: Past, present and future. Nairobi: Institute of African Studies: University of Nairobi, pp. 61–74. Kusimba, C. M. and Kusimba, S. B. (2004). Mosaics and interactions: East Africa, 2000 b.p. to the present In: Stahl, A. ed. African Archaeology: A critical introduction. Oxford: Blackwell, pp. 392–419. Loiske, V. (2004). Institutionalised exchange as a driving force in intensive agriculture: an Iraqw case study In: Widgren, M. and Sutton, J. E. G. eds. Islands of intensive agriculture in Eastern Africa. Oxford: James Currey, pp. 105–113. Ludwig, H. D. (1968). Permanent farming on Ukara: the impact of land shortage on husbandry practices In: Ruthenburg, H. ed. Smallholder farming and smallholder development in Tanzania: ten case studies. Munich: Weltforum, pp. 87–135. Masao, T. (1974). The irrigation system in Uchagga: an ethno-historical approach. Tanzania Notes and Records 75: 1–8. Östberg, W. (2004). The expansion of Marakwet hill-furrow irrigation in the Kerio Valley of Kenya In: Widgren, M. and Sutton, J. E. G. eds. Islands of intensive agriculture in Eastern Africa. Oxford: James Currey, pp. 19–48. Peristiany, J. G. (1951). The age-set system of the pastoral Pokot. Africa 21: 188–206, DOI: https://doi.org/10.2307/1156500DOI: https://doi.org/10.2307/1156592 279–302. Pike, A.G. (1965). Kilimanjaro and the furrow system. Tanganyika Notes and Records 64: 95–6. Scarre, C. (2005). Holocene Europe In: Scarre, C. ed. The human past: World prehistory and the development of human societies. London: Thames and Hudson, pp. 24–43. Smith, B. D. (1995). The emergence of agriculture In: New York: Scientific American Library. Soper, R. C. (1983). A Survey of the Irrigation System of the Marakwet In: Kipkorir, B. E., Soper, R. C. and Ssennyonga, J. W. eds. Kerio valley: Past, present and future. Nairobi: Institute of African Studies: University of Nairobi, pp. 75–95. Spear, T. (1993). Being ‘Maasai’, but not ‘people of cattle’: Arusha agricultural Maasai in the nineteenth century In: Spear, T. and Waller, R. eds. Being Maasai: Ethnicity and identity in East Africa. London: James Currey, pp. 120–136. Spear, T. (1997). Mountain farmers: Moral economies of land and agricultural development in Arusha and Meru In: Oxford: James Currey. DOI: PMCid: PMC237336. Spear, T. and Waller, R. eds. (1993). London: James Curry. Spencer, P. (1965). The Samburu: a study of gerontocracy In: London: Routledge and Kegan Paul. Spencer, P. (1998). The pastoral continuum: the marginalisation of tradition in East Africa In: Oxford: Clarendon Press. Ssennyonga, J. W. (1983). The Marakwet irrigation system as a model of a systems-approach to water management In: Kipkorir, B. E., Soper, R. C. and Ssennyonga, J. W. eds. Kerio valley: Past, present and future. Nairobi: Institute of African Studies: University of Nairobi, pp. 96–111. Stump, D. (2003). The soils of Engaruka: Preliminary soil exhaustion tests on a pre-colonial agricultural landscape in Tanzania In: Mitchell, P., Haour, A. and Hobart, J. eds. Researching Africa’s past: New contributions from British archaeologists. Oxford: Oxbow Press, pp. 101–109. Stump, D. (2006a). Towards an applied archaeology of East African intensive agriculture. Doctoral dissertation, University College London, London. Stump, D. and Tagseth, M. (2009). The History of Precolonial and Early Colonial Agriculture on Kilimanjaro: A Review In: Clack, T. ed. Culture, History and Identity: Landscapes of Inhabitation in the Mount Kilimanjaro Area, Tanzania. Oxford: Archaeopress, pp. 107–124. Sutton, J. E. G. (2000). Engaruka: farming by irrigation in Maasailand c. A.D. 1400–1700 In: Barker, G. and Gilbertson, D. eds. The archaeology of drylands: Living at the margin. London: Routledge, pp. 201–219. Sutton, J. E. G. (2004). 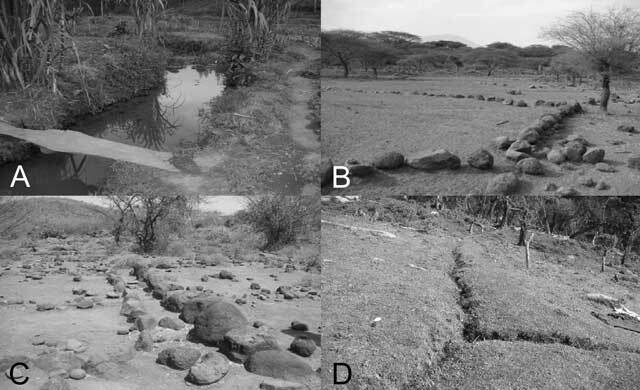 Engaruka: The success and abandonment of an integrated irrigation system in an arid part of the Rift Valley, c.15th to 17th centuries In: Widgren, M. and Sutton, J. E. G. eds. Islands of intensive agriculture in Eastern Africa. Oxford: James Currey, pp. 114–132. Thomson, J. (1885). Through Masai land In: London: Sampson Low. Turner, B. L., Hyden, G. and Kates, R. W. (1993). Population growth and agricultural change in Africa In: Gainesville: University of Florida Press. van Andel, T. H. and Runnels, C. N. (1995). The earliest farmers in Europe. Antiquity 69: 481–500. von Höhnel, L. R. (1892). Zum Rudolph-See und Stephanie-See: Die Forschungsreise des Grafen Samuel Teleki in Ost-ecuatorial-Afrika 1887–1888 In: Vienna: Hölder. Waller, R. (1988). Emutai: crisis and response in Maasailand 1883–1902 In: Johnson, D. H. and Anderson, M. eds. The ecology of survival: case studies from Northeast African history. London: Lester Crook Academic Publishing, pp. 73–112. Watkins, T. (2005). From foragers to complex societies in the Southwest Asia In: Scarre, C. ed. The Human Past: World prehistory and the development of human societies. London: Thames and Hudson, pp. 200–233. Watson, E. (2004). Agricultural intensification and social stratification: Konso in Ethiopia contrasted with Marakwet In: Widgren, M. and Sutton, J. E. G. eds. Islands of intensive agriculture in Eastern Africa. Oxford: James Currey, pp. 49–67. Widgren, M. (2000). Islands of intensive agriculture in African drylands: towards an explanatory framework In: Barker, G. and Gilbertson, D. eds. The archaeology of drylands: living at the margin. London: Routledge, pp. 252–267. Widgren, M. (2004). Towards a historical geography of intensive farming in Eastern Africa In: Widgren, M. and Sutton, J. E. G. eds. Islands of intensive agriculture in Eastern Africa. Oxford: James Currey, pp. 1–18. Widgren, M. and Sutton, J. E. G. (2004). Islands of intensive agriculture in Eastern Africa In: Oxford: James Currey. PMCid: PMC484205. Zaal, F. and Dietz, T. (1999). Of markets, meat, maize and milk: Pastoral commoditization in Kenya In: Anderson, D. M. and Broch-Due, V, V. eds. The poor are not us: Poverty and pastoralism. Oxford: James Currey, pp. 163–198.